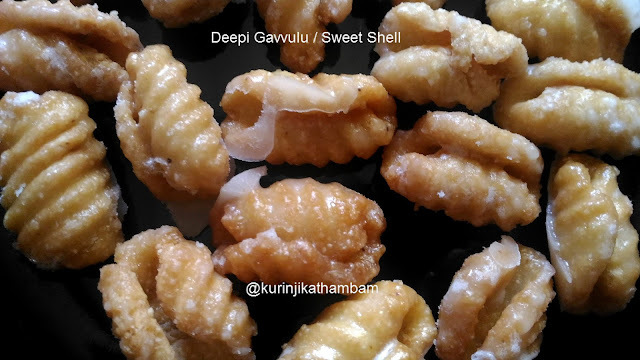 Andhra sweet called Andhra Deepi Gavvulu or Sweet Shell. Gavvulu means shell and is named so because of its shell like shape. 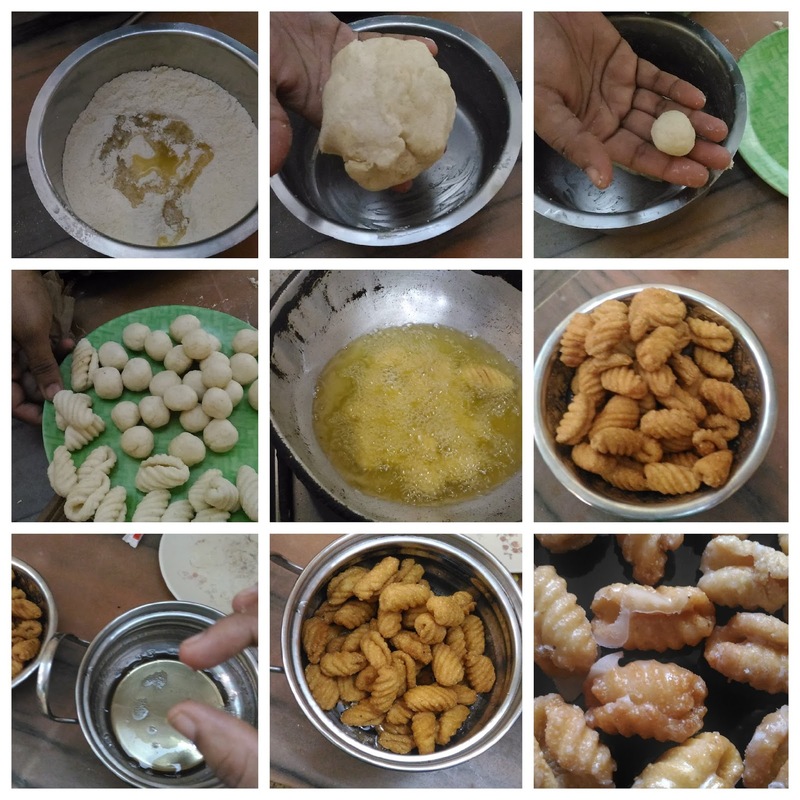 What is more important is that the recipe is very simple even for a beginner. Even though this is sweet, you will not get overwhelmed by having a few Gavvulus. You will always want to eat more. * Use any measuring cups. 1. In a wide bowl, add maida, rava and salt. Mix them well. 2. Heat the dalda till it melts completely. 3. Now add the melted dalta to the maida mixture (from 1). Mix them quickly with the help of the spoon. 4. Now add the water little by little and make a soft and pliable dough. Keep it aside for 5 mins. 5. Now make turkey berry size balls from the dough (from 4). 6. Take fork (backside) or new comb or gavvulu making wood, keep one ball over the fork/comb/wood. 8. Make shells from all the balls and keep it aside. 9. Heat the oil in pan, deep fry the shells till they become golden in color. Don’t over load the oil with the shells. 10. Meanwhile, add sugar and water in a bowl. Bring it into boil. Boil the syrup till you can get the single string consistency. 11. Now remove from the heat, them immediately add the deep fried shells (from 9) and mix them gently till the sugar syrup will coat well with all the shells. 12. Remove from the syrup and allow it to cool down and dry. 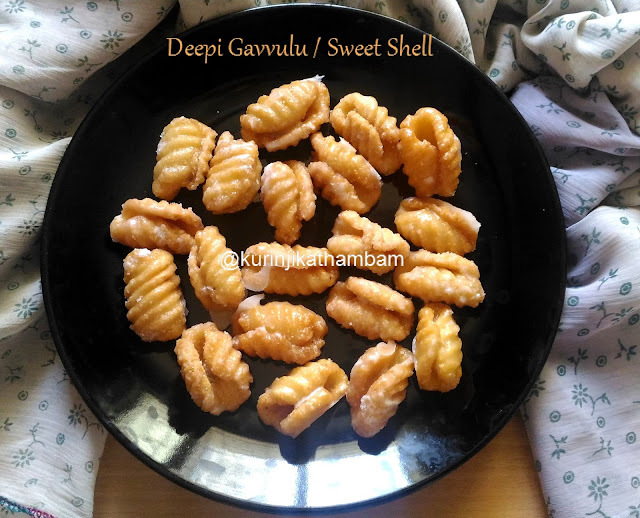 Yummy, tasty and easy Deepi Gavvulu / Sweet Shell is ready to serve. 1. You can use hot oil instead of dalda. 2. 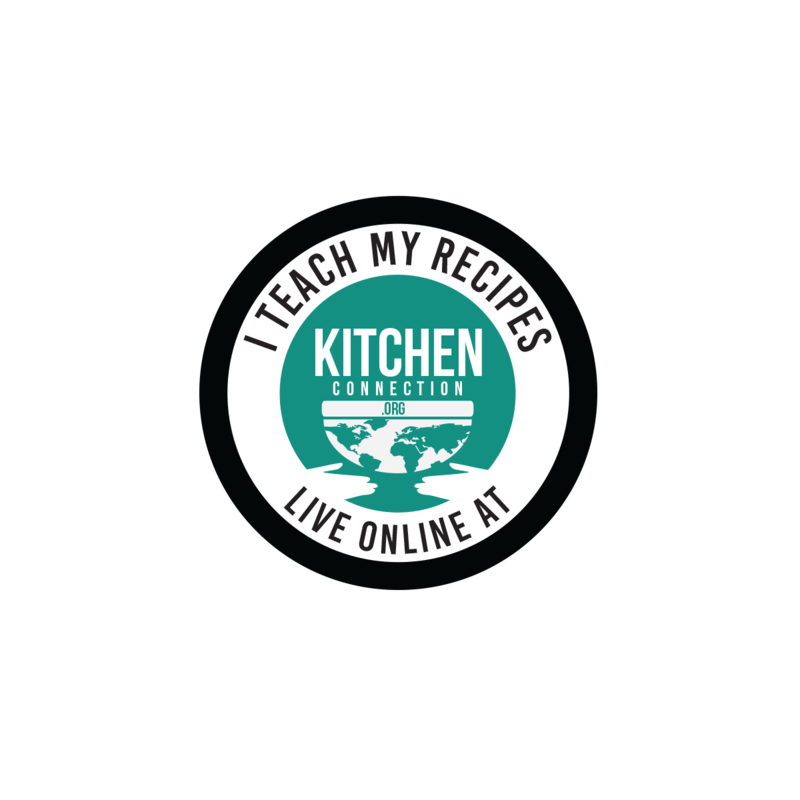 I have used 240 ml cup for this recipe. So that I got 30 shells.